Apparently, it was National Dog Day yesterday. Perfect timing to show off the Scottie Dog Dress I made a little while ago. Our little doggie was kind enough to star as my fashionable accessory. He actually looks a bit like the dogs on the fabric’s print. 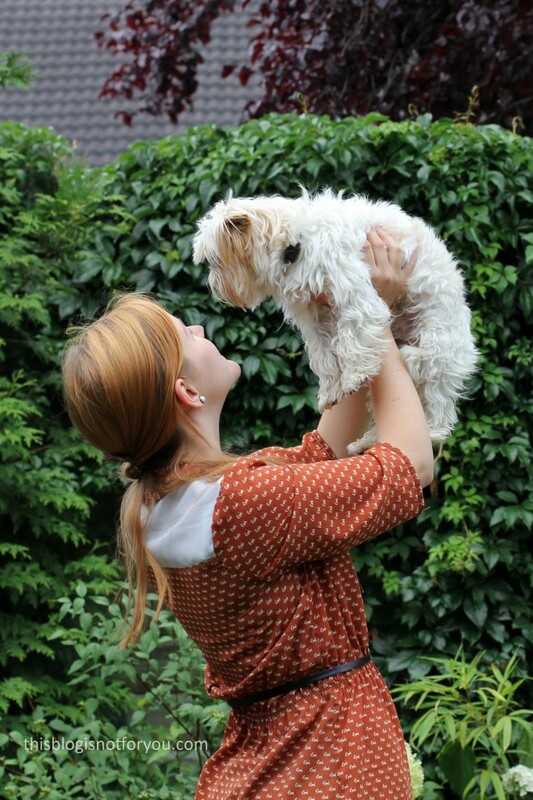 A cute dress paired with a cute dog – could I wish for more? I bought the fabric ages ago in Walthamstow, London. For those of you who know the area, it’s the last fabric shop on the left side of the road, when you walk down the market coming from Walthamstow Station. I don’t remember the name of the shop, but it’s near Saeed’s Fabrics. It’s a tiny shop with loads of cheap polyester, chiffon and jersey fabrics. It’s perfect if you’re looking for fun prints but don’t want to spend a lot of money. I usually use these kinds of fabric for wearable muslins and experimental projects, where everything can go wrong (but it doesn’t have to!) and you want to use fabric you won’t cry for later. And it’s acutally cheaper than proper cotton muslin fabric! The doggie print is a £1/m polyester fabric. It’s easy to cut and sew, but you have to be careful when pressing it. It melts (and darkens) easily. Press on a low temperature using a pressing cloth! It has quite a bit of stand and doesn’t drape too well as you can see around the waist line. It adds quite a bit of volume! 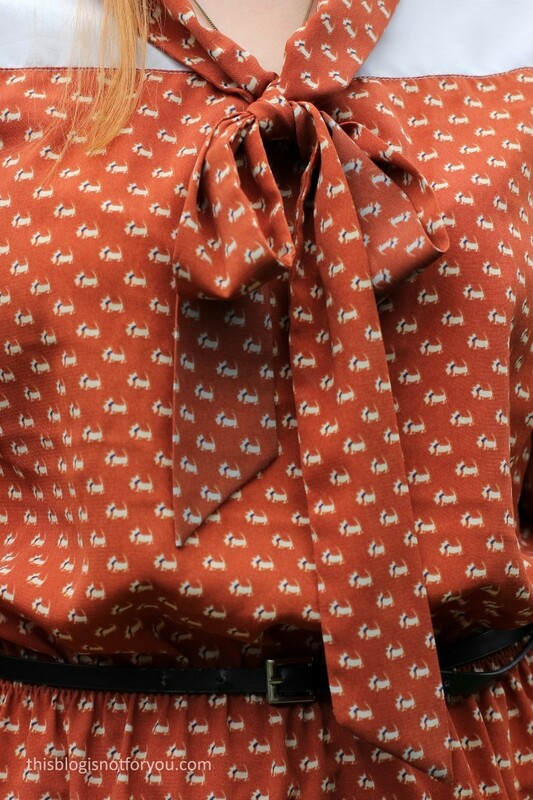 I also bought the same fabric in black with tiny elephants, which I used for my first Lottie Blouse. The white, slightly sheer fabric is also a polyester which I bought on Goldhawk Road, London. I used this fabric before, for my first Lottie hack. 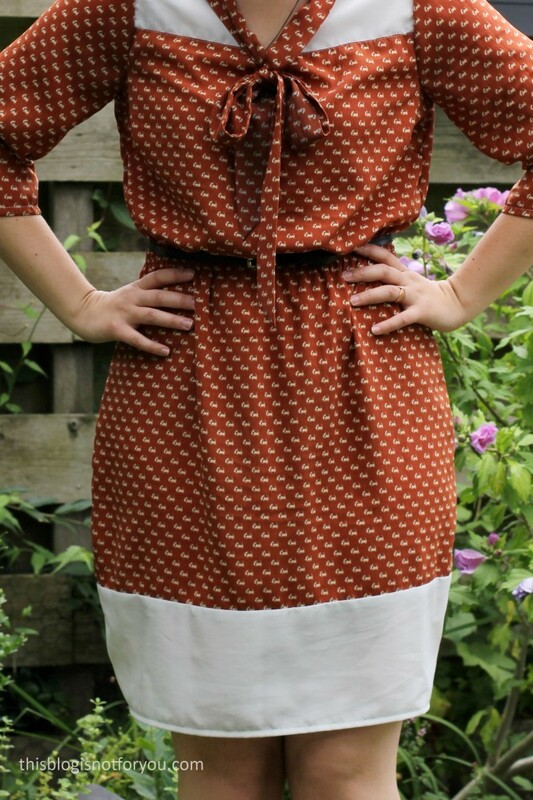 The pattern is – what a surprise – the Lottie Blouse pattern from Love Sewing Magazine which I have hacked into a dress with a contrasting yoke. I’ve made the blouse loads of times using different hacks and fabrics each time (here, here, here & here). I won’t say much about the pattern, as I have reviewed it before. Check out the other posts if you want to know more about it! I more or less kept the blouse except for slashing the front and back bodice pattern to add a seamline for the contrasting yoke. This is pretty simple: you slash the pattern where you want the new seamline to be and add seam allowance to the new edges. I pressed the seam allowance downwards so you can’t see it throught the sheer white fabric. It’s topstitched into place with white contrasting thread. I lengthened the blouse to knee-length, keeping the waist fairly straight and curving out and in a bit at the hips and knees. Again, I slashed the pattern to add the contrast panel at the hem. I’ve kept the bodice and skirt slightly larger than my usual size. The polyester fabric is very lightweight and nice for warmer days, but it’s not as comfy as cotton on hot summer days, so it’s better to leave a lot of ease. I’m not sure why I keep using this pattern again and again. It’s quite versatile and comes together super quickly (which is probably why). Who doesn’t love quick projects for when you have too little time to sew? What’s the pattern you have used most often? Wedding Dress Part I: Decisions, decisions! Lovely & amazing that your dress matches your dog:) I love a quick sewing project – I like to undertake more complex projects from time to time, but with lots of quick projects in between. Same here! Quick projects are just so satisfying! I like complex projects with loads of handsewing, but if I’d make them too often I would probably become lazy and wouldn’t put as much care in them. Love this, the print is so cute. Works well with the contrast yoke too. Great hack as a dress. Love how the contrast fabric works and the fabric is fantastic, also that colour just suits you so much, lovely job! I’ve bookmarked your blog just for this hacked pattern. I love it so much! Looks very attractive on you. Went hunting for the pattern, but was disappointed that I was not able to find it. Thanks for sharing a cute sew! !